Every so often, we get a day off from activities and appointments that seem to rule all our free time. 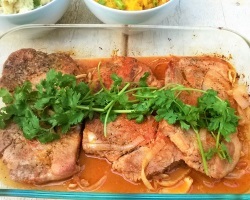 Here's a dinner at our house on one such day… Homemade Tomato Sauce over spaghetti with a side of Paprika Lime Pork and Kale and Leek Stirfry. A fusion of a few cultures in one plate… my favorite kind of meal.. A toast to sit-down family dinners! 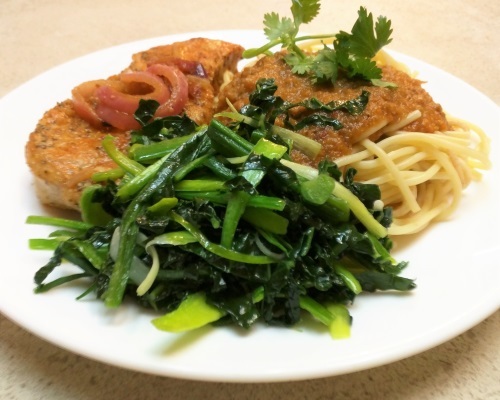 This is a quick and easy meal, great for a weeknight. The tang of lime complements the mild spiciness of paprika. Feel free to substitute with hot chili powder to increase heat. This is a grown up version of the pasta sauce I used to make in college. I use fresh tomatoes in this homemade spicy pasta sauce. You can use frozen tomatoes if you prefer, without detracting from the taste too much. Canned tomatoes, however, I found doesn't have the tang that comes with fresh tomatoes. I decided to omit tomato paste to avoid masking the amazing flavors of the fresh tomatoes. Unfortunately, tomato paste also helps redden the color of the sauce, so omitting it causes the sauce to be less red. It's an easy sauce to make, so give it a try! Double the recipe and save some in the freezer. You' won't want to go back to store bought pasta sauce after you have tried this sauce. I have been cooking with kale for a while now, and this is my favorite way of preparing it - cut thinly and stir fried with leeks. Leeks impart a sweetness to the kale and complements it perfectly. This dish works well as a vegetable side to any dish.